Lens Description: The Panasonic premium LUMIX G X VARIO PZ 14-42mm/F3.5-5.6 ASPH./ POWER O.I.S. 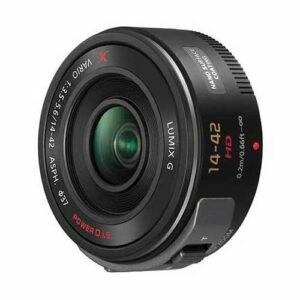 (H-PS14042) lens is the newest addition to the Lumix CSC lens lineup. With electric-powered zoom operation, the retractable Power Zoom H-PS14042 lens is extremely compact, approximately 26.8mm in length, and weighs approximately 3.35oz, offering ultra-high portability.Panasonic’s new premium LUMIX ”X” Series of lenses, including the LUMIX G X VARIO PZ 14-42mm/F3.5-5.6 ASPH./ POWER O.I.S., offers a versatile zoom range of 14-42mm (35mm camera equivalent: 28-84mm) suitable for a wide range of scenes, such as dynamic landscape to portrait. Crystallizing Panasonic\'s optical technologies, the LUMIX X lenses feature superb image rendering for lifelike textures, crisp edge-to-edge contrast, a unique Nano Surface Coating to help minimize ghosts and flaring in natural settings with remarkable transparency.